These 10mm acrylic belly bars have ripple design, UV glow balls and are available in mustard, orange, blue, purple, green and black. 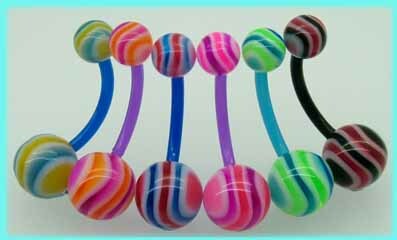 These plastic belly button bars feature colourul ripple patten balls and have a 10mm acrylic shaft. They are a great alternative to surgical steel navel jewellery and are available in six different colours. Powered by ShopFactory to sell P8328 online. All-in one eCommerce and online shopping cart software.